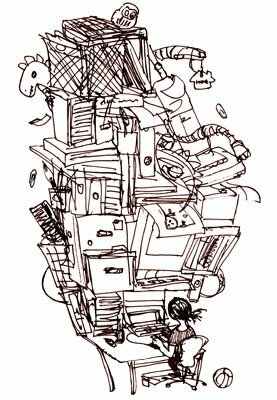 One of the benefits of having company over is you have to do something about the clutter that manages to make its presence known enough to annoy you, but never enough to make you do something about it. "You" in this case meaning "me", because I'm SURE none of YOU have this problem. So, with Thanksgiving company on the horizon, it was time to break into action and take back the living room. Which I did with amazing speed and style (if I do say so myself). This room hasn't been this clean and put together since the big paint job a couple of years back. The downside of suddenly having a clean space is that all the aforementioned clutter needs a "place to be". Much like one of those sliding puzzles, everything needs to shift once again so the piles (albeit smaller, as compared to years past) can be sorted and the items returned to their proper places. Sadly, work on my bedroom begins -- once again -- tomorrow.